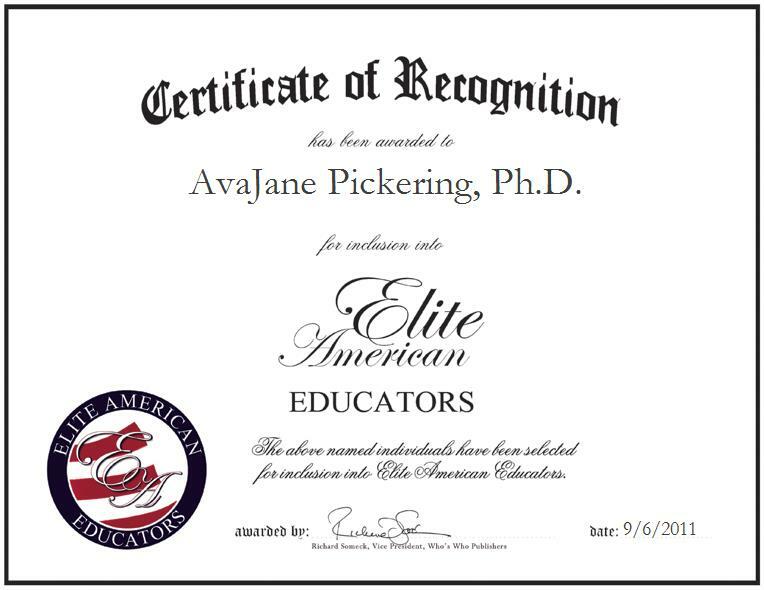 SALT LAKE CITY, UT, September 6, 2011, AvaJane Pickering, Ph.D., Owner and Director of SEPS Learning Center, has been recognized by Elite American Educators for dedication, achievements, and leadership in brain therapy and special education. For Dr. Pickering, the field of learning disabilities captured her imagination nearly four decades ago. She has devoted her career to providing specialized academic programming for students with a variety of learning disabilities, including those with mild and moderate disabilities, and those with more severe needs. With a strong interest in the design, supervision, and evaluation of educational program administration, she established SEPS Learning Center, an independent private school and clinic, with her twin sister. There, she makes it her priority to assess children and adults, and accommodate their special education needs. She has implemented programs that have proved to increase performance, productivity, and proficiency in academic, social, emotional and cognitive achievement. For Dr. Pickering, the success of her students after they leave the learning center is her greatest achievement and the most gratifying aspect of her career. Dr. Pickering stresses the importance of “not waiting.” She advises parents to pay prompt attention to their child if they exhibit signs of attention deficit disorder, difficulties with reading comprehension, or delayed development, for example a 3-year-old child who does not talk. With a student to teacher ratio of 3:1, SEPS offers a full range of required and elective subjects including reading, language arts, foreign languages, science, social studies, health, writing, art, and mathematics. However, Dr. Pickering notes that the curricula are focused around creative and hands-on learning exercises. Each day, she is proud to facilitate self-advocacy of individuals with learning disabilities and communication disorders, while also teaching the skills necessary to combat learning disabilities. Students who attend SEPS are also exposed to social skills and cognitive processing skills for daily tasks. A graduate of the University of Utah, Dr. Pickering earned a Ph.D. in special education after obtaining a Master of Science in special education, and a Bachelor of Arts in social studies education from Purdue University. She holds a special education teaching certificate for severe, mild and moderate disorders from Brigham Young University, a certification in conflict resolution and mediation, and is an administrative licensed assessor. She is very involved with her field on the state and national levels, retaining memberships with the Council for Exceptional Children, the Learning Disabilities Association of Utah, the Learning Disabilities Association of America, the Association of Educational Therapists, the CUED Language Network of America, the CUED Speech and Language Association, the National Association for the Education of Young Children, and the Tourette Syndrome Association, among many others. Dr. Pickering is an award-winning educator. She was honored with the President’s Award for Distinguished Services from the Learning Disabilities Association of Utah, the Sam Kirk Award from the Learning Disabilities Association of Utah, and was named Outstanding Educator by the Learning Disabilities Association of America. For more information about SEPS Learning Center, please visit http://www.sepslc.com.